Lal Bahadur Shastri Institute of Management hosted a National Human Resource Conference on ‘HR Beyond Boundaries: Challenges and Opportunities’ at its campus in Dwarka Sector 11. The conference was inaugurated by Dr. A.K. Balyan, MD and CEO of Petronet LNG Ltd. 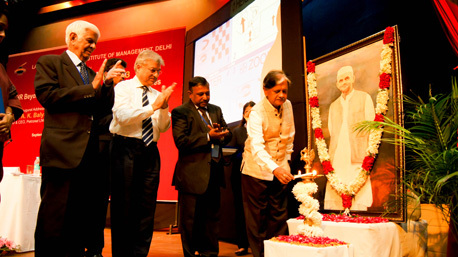 In his inaugural address Dr Balyan stressed on the need for HR to work in the context of a business model. A business model requires the right technology, processes and systems & the key differentiator being “People” in order to be successful. He also spoke about the need for HR to anticipate and prepare for change in today’s dynamic business environment through HR data, analytics and accurate metrics developed for the organizational needs and aspirations and thus be able to leverage the technology and capabilities of its talent to increase its market share. Shri Anil Shastri, former Union Minister and Chairman of the Board of Governors at LBSIM, delivered the presidential address in which he iterated the need for leaders as great role models and good listeners in order to understand and proactively address the issues in their organization. Dr. P.K. Biswas , Director – LBSIM, asserted that the role of HR should not be viewed only in the organizational context but also as contributor to the community and society at large. Dr.Bindu Chhabra, Conference Convenor, elaborated on the various topics that would be covered in the conference under Talent Management, HR as a strategic Business Partner, Work Life Balance etc. and their increasing relevance in today’s world where the roles of HR managers are constantly evolving. The conference was divided into two technical sessions titled “Latest Trends in Strategic Human Resource Management” and “HR and Generation Next” which were attended by eminent academicians and industry professionals including Mr. Vijay Deshpande, Vice President HR- JK tyres, Mr.Rohil Khanna, Associate Director – Ernst and Young, Mr.BehramSherdiwala, President HR – ACC Limited, Mr.Nirmal Singh Raghav, Vice President – Idea Cellular Ltd, Mr.AnshulKhurana, Sr. Talent Partner – Adobe Systems and many others. The sessions covered a wide range of topics like Competency Based Management, Role of HR in Mergers and Acquisitions, Fostering Innovation and Entrepreneurship and the Dynamics and Trends of today’s Global Workforce. The conference served as an excellent platform to absorb insights on how to think beyond the traditional HR role and bring to surface some radical innovations which can bring strategic transformations in the same.